I am writing new texts for my website. First I wrote it all in Dutch. Now I am translating into English (UK). Please read them. Give your comments so I can make them better, before they appear in my website. ... your baby grows so fast, becomes a toddler, soon a teenager! I put the phase in life down in a portrait and you will enjoy forever! ... your parents have their fiftieth wedding anniversary only once in their lives. A portrait of them together is a great gift! I can use their wedding photo, or more recent pictures as my reference. ... you lost a beloved one (human or animal) in death. You miss him/her every day. You don’t want to forget him/her. With my portraits for ‘in memoriam’ the bereavement will feel a little softer. ... you want to present yourself in a professional way. You want a portrait that shows who you really are. 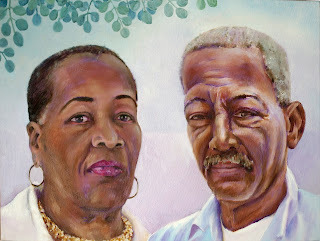 I paint portraits you really want to show in your company. ... there is so much you value. A place of nice memories. A special event. Something you love to see. You name it. If there are photos of it, I can use them for a drawing or painting. Otherwise I find or make photos and use my imagination. ... an ordinary snapshot doesn’t have the impact of a drawing or painting. Using them to make a drawing or painting with the help of your photos I make souvenirs of lasting value. In my childhood my parents stimulated my creativity. They also taught me to love nature. I did my best to choose a school that would help me use my creativity in my life. My choice was a school for becoming a teacher in drawing and textile arts. But I found it wasn’t the right choice. ‘In front of the class’ was not my kind of place. After two years I left the school. But I was glad I learned a lot about many different techniques. I married and had children. My creativity was limited to a ‘hobby’. It was in my second marriage I discovered it could be more than that. My new husband, Carlos, promoted me as an ‘artist’ for his friends and family. I started painting portraits, as gifts. Would I be able to become a professional artist? That question appeared and reappeared in my thoughts. I started making paintings I wanted to sell. I had booths at local art-fairs. On the internet I did what I could to ‘become known’. In 2013 I saw there was a market for my art. At exhibitions my watercolours were sold. I had some commissions. I was even asked to illustrated a children’s book! The office-job I had to earn my money felt like it took too much of my precious time. I was happy to hear the company wanted to ‘shrink’ and I could stop there when my contract would end. I registered at the Chamber of Commerce for ‘the big step forward’. To illustrate it here is a portrait paintings I made recently.